I was watching a reality show last week where teams of three would go madly racing from one city to the next. One of the teams got in their truck to go to the next destination and the truck wouldn’t start. None of the three men on the team were very mechanical, so they started looking on their phones to see what the problem could be; one of them even called a family member for advice. At one point one of them was on the ground under the truck hitting something with a giant metal spoon before a kind passerby asked if they needed a jump. Lo and behold, they merely had a dead battery and five minutes later they were back on the road again. I could relate. I’m a chronic overthinker. I may think of a half dozen solutions to a problem before I see the one right in front of my face. I’m like a dog trying to go through a doorway with a bone in its mouth that’s too wide to fit. I’d smash through the doorway before I’d think to turn my head. 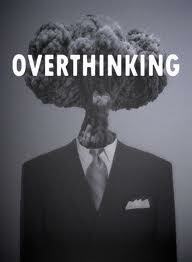 There are obvious disadvantages to being an overthinker. What should be simple tasks can take a lot longer to solve or complete than they really should. I remember a time at work where a few of us guys (dubbed The Strongbacks) were rounded up to move some tables and chairs around for a function. The chairs were able to be stacked, but the legs had to be turned a certain way to do it. I saw another guy carrying a stack of five or six so I knew it could be done, but I didn’t see how he did it. I spent close to five solid minutes wrestling to stack one chair on top of another before I realized the other guys were standing back having a laugh at my expense. Frustrated, I took a couple of steps back and asked one of them to do it if they were so damn smart. A young guy came up with a big cheesy grin on his face, twisted the top chair just so, and had the two chairs stacked in approximately two and a half seconds. I chuckled to prove to the guys I had a good sense of humor about my inadequacy, even though in my head I felt like punching that young guy in the mouth. Even though I’ve come to grips with being the way I am, moments like that still tend to be embarrassing and more than a little frustrating. There are also some advantages to being this way as well, I suppose. In a way, it’s a bit like thinking outside the box. While “normal” people are presented with a problem and all come up with the same solution, I’ll come up with something way out of left field that ‘the normals’ wouldn’t have thought of. Also, when you do finally think of the solution to a problem and it turns out to be a simple fix, you may feel silly and frustrated for not thinking of it sooner, but it’s such a relief. It feels like the weight of the world has been lifted from your shoulders, setting you free to go back to living your life. So there’s that. What got me thinking about all this was a story I have percolating in the back of my mind (yes, I’m still going to talk about writing from time to time). I wrote the rough draft and tried to stop thinking about it because I wasn’t very happy with the way it turned out. I read somewhere you should try not to go back to a story until you forgot most of what you wrote, so I was trying to do that. Still, problems with the plot stuck in my mind. When I lay in bed, plots holes and questions of character development are what go through my head now before I fall asleep. Completely out of nowhere a notion hit me, and I realized a solution to one of my problems was right there, patiently waiting for me to see it. It’s not going to solve all the problems I’m having, but it could be the piece that sets things in motion to get me back on track. OverThinkers unite! For anyone still trying to keep track of what’s going on with my writing: the last time I talked much about any of my work, I was getting ready to expand a previously thought-to-be-completed novella into a full-fledged novel. Yeah, that hasn’t happened. I sat down to get started, and realized even though I knew where I wanted to end up I didn’t know where to start. I gave it about a week; I even tried to force it at one point and squeezed out a scene to see if it kick-started anything. Nope. Instead, I took off with an idea that had been burning like a fuse at the base of my skull. Progress has been a little slow due to circumstances beyond my control, but I’ve managed just over 5,000 words so far, and I’m really excited about it. On the surface it’s a fairly standard mystery/thriller about a detective on the hunt for a killer, but I have a few tricks up my sleeve to hopefully keep it interesting. The focus of the blog may turn back toward writing soon, as the stars in my life prepare to align, allowing me to devote more time to both finishing this new rough draft as well as editing and rewriting another neglected story. Okay, overthinkers, let me hear you. Do you struggle with things that should only take a minute because you instantly think of the hard way first? Have you done anything to change the way you approach problems so you don’t take so long to get from point A to point B? And lastly, do any of you actually read blog posts that turn out to be this long? PS – I uploaded a new short story to my Readwave page. It’s creepy and very short. It’ll take you less time to read than it did to read this long-winded post. It’s called Mikey, and you can find it here. PSS – Anyone else going to start reading Doctor Sleep today? This entry was posted in Writing and tagged Critical thinking, over thinking, Thinking outside the box, Writing. Bookmark the permalink. Thanks for the reply. I get a little self conscious when a post starts running long, I try to keep them under 750 words or so and this one just kept climbing! Anyway, there are too many extremists around us, they either overthink or don’t think at all and i’m the second one. why complication? simplicity is the ultimate sophistication, don’t you agree? It’s a matter of practice, try to be simpler and take a shorter path to come out with your solution. I agree, the beauty of simplicity can sometimes be overlooked and unappreciated. 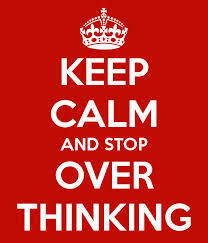 I’m working to correct my thought process, but find myself still overthinking things more often than I’d like to admit. Thanks for stopping by!